Milton is disappointed that poor health prevented her from visiting Berry on her way north. She has sent to Berea College a table and shoe box for which the designs are currently popular in New York, hoping they will copy and sell the items. If Berry arranges to copy the items as well, she can assist in selling them. Milton describes her speaking engagements at the Southern Industrial Educational Association, provides news of mutual friends, and tells Berry about a prospective donor, Mrs. Edward Moen. 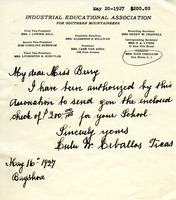 The treasurer Mrs. Ceballos sends a donation to Berry Schools of $200 on behalf of the Association. 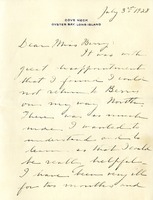 Mr. Stone writes to Martha with a donation of 50 dollars for the school. He also mentions the Trustees voted to turn over the Ambler Fund to be used as a scholarship. The Southern Industrial Educational Association asks to be put off the mailing list for the Southern Highlander because they are closing down.